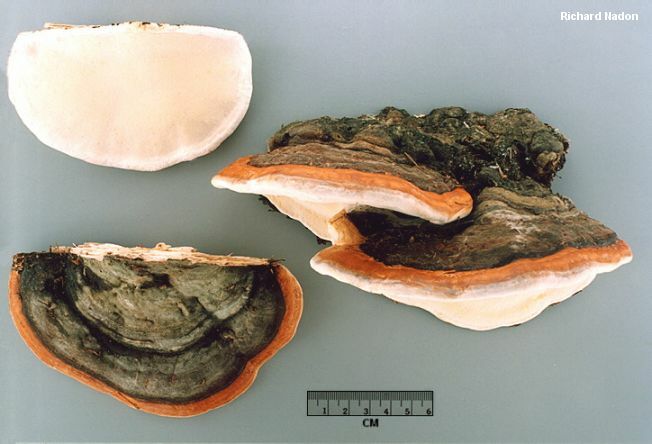 Distinguishing features for Fomitopsis pinicola include its tough, woody consistency (it is perennial, and develops a new tube layer every year); the varnished cap surface that is usually red to reddish brown with a white or yellow margin; the cream colored pore surface that does not bruise brown; and the red reaction of the flesh to KOH. Similar species include Ganoderma tsugae (annual and corky, rather than perennial and woody) and Heterobasidion annosum (with less clearly defined, browner caps). Ecology: Saprobic on the dead wood of conifers and sometimes hardwoods (including birch and aspen); also sometimes parasitic on living trees; causing a brown cubical rot; growing alone or gregariously; perennial; fairly widely distributed in North America where conifers are present, but apparently rare to absent in the southeastern United States. Cap: Up to about 40 cm across and 10 cm deep; semicircular or fan-shaped; convex or hoof-shaped; smooth, becoming wrinkled with age; appearing varnished toward the margin (and overall when very young); red to dark brownish red (or brown to black toward the point of attachment or when mature), with a white to yellow marginal area. Pore Surface: Cream colored; not bruising significantly; with 3-6 round pores per mm; tube layers usually fairly distinct, up to 8 mm deep. Flesh: Whitish; leathery to woody. Odor: Musty and strong when fresh. Chemical Reactions: KOH on flesh red to dark brownish red. Microscopic Features: Spores 6-9 x 3.5-4.5 µ; cylindric; inamyloid; smooth. Hyphal system trimitic. REFERENCES: (Swartz, 1810) Karsten, 1881. (Fries, 1821; Overholts, 1953; Smith, Smith & Weber, 1981; Arora, 1986; Gilbertson & Ryvarden, 1986; States, 1990; Phillips, 1991/2005; Lincoff, 1992; Evenson, 1997; Barron, 1999; Roody, 2003; McNeil, 2006; Miller & Miller, 2006; Trudell & Ammirati, 2009.) Herb. Kuo 01140601.